William Pardy was born in Yeovil in 1826 and baptised in St John's church on 28 June 1826. He was the son of carpenter William Pardy (b1789) and glove sewer Sarah née Glyde (b1796). In the 1841 census William and Sarah were living in the first house in Belmont (where Belmont joins Park Street at the junction with Penn Hill) with their nine children including 14-year old William who was a Glover's Apprentice. By the time of the 1851 census the family were still at the same address and William now gave his occupation as a Glover. William went into partnership with Edmund and George Davis, trading as Davis & Pardy, Glove Manufacturers. In the winter of 1856 William married Ellen Rake (b1842), daughter of William (d1860) and Ann Rake of Silver Street. In its edition of 22 May 1858 Perry's Bankrupt Gazette recorded that the partnership between William Pardy and the Davis brothers was dissolved effective from 1 March 1857. William, however, carried on as a Glove Manufacturer on his own and in the 1861 census he was recorded living in South Street with Ellen and a domestic servant. William stated his occupation as "Glove Manufacturer employing 18 Men & 4 Boys". The Post Office Directory of 1866 listed "William Pardy, Glove Manufacturer of South Street". In November 1865 William was sworn in as one of twenty Special Constables for the Borough of Yeovil for the ensuing year. Unfortunately William experienced severe financial problems and was made bankrupt on 25 September 1868 but before the bankruptcy was declared he absconded to Manchester with part of his stock in order to sell it. The full story is told in the Gallery below. In the 1871 census William and Ellen were living in Middle Street, close to the junction of Station Road. William gave his occupation simply as a Glover. William died in Yeovil in the autumn of 1874. He was aged 47. 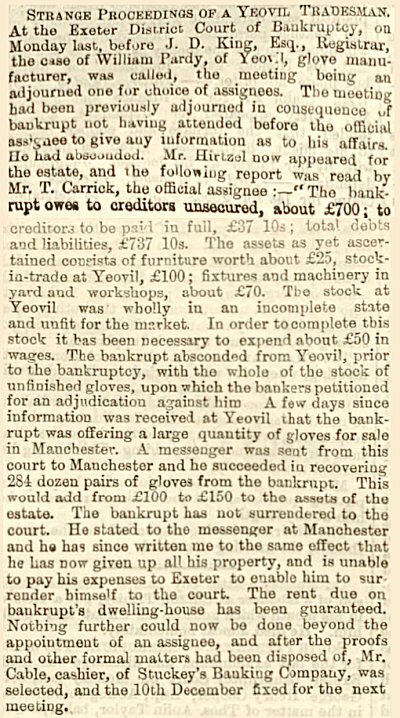 The "Strange Proceedings of a Yeovil Tradesman" - the story of William's bankruptcy and his absconding to Manchester to sell his stock as reported in the 23 October 1868 edition of the Western Gazette. 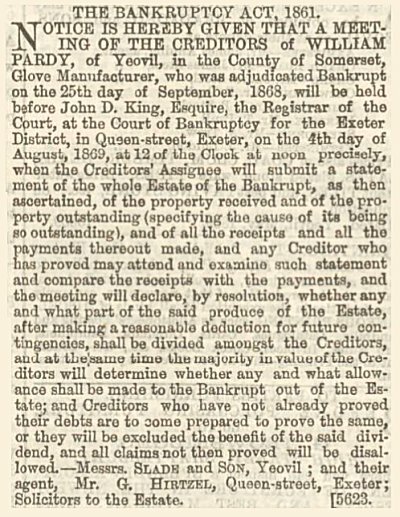 The notice of William's bankruptcy from the 2 July 1869 edition of the Western Gazette.